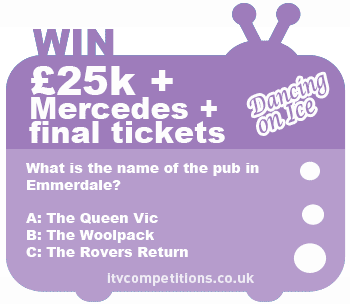 Dancing on Ice competition – win a Mercedes car, £25k & final tickets to Dancing on Ice for 4 people + hotel! What is the name of the pub in Emmerdale? You can enter the Dancing on Ice competition 6 times per phone number for free via the itv.com competitions entry form (entering by phonecall/sms will cost +£1.50 per call/text).